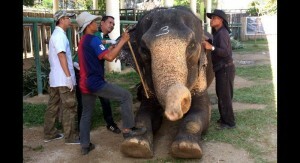 Officials from the National Park, Wildlife and Plant Conservation Department (DNP) yesterday took DNA samples from 67 elephants, including those that perform at the popular Phuket FantaSea tourist attraction in Kamala, as part of a drive to crackdown on elephants trafficked onto the island. There are currently 222 elephants registered at 23 camps in Phuket, said Supot Praedpring, Director of the DNP regional office in Nakhon Sri Thammarat. 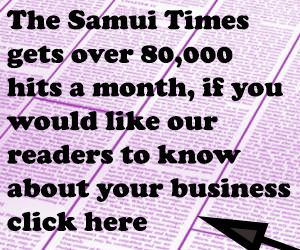 “Today we checked four elephant camps with 32 elephants all used by Phuket FantaSea as well as 20 elephants at Pang Chang Hai elephant camp, 13 elephants at Kalim elephant camp, and two elephants at Tritrang elephant camp,” Mr Supot said. The DNA tests are part of a five-day campaign that began yesterday (Jan 18) to confirm the identity of all registered elephants on the island, including those used at tourst attractions and jungle-rekking tours, he explained. The DNP teams, assisted Department of Livestock and Department of Provincial Administration officials, are checking identification certificates and microchip implants. 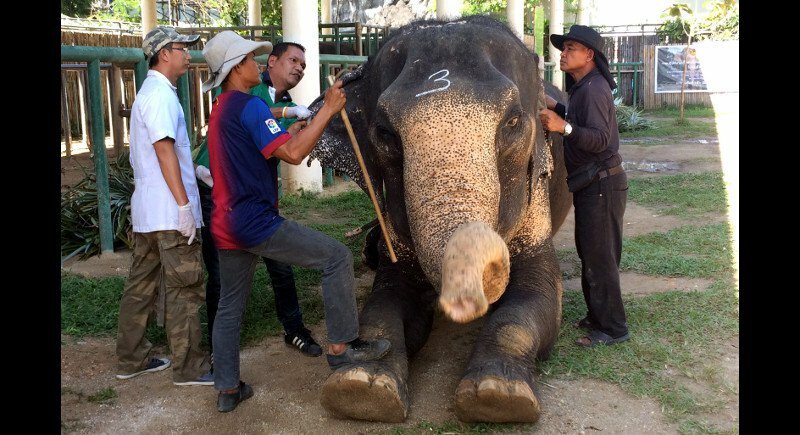 “Officials from the Veterinary Research and Development Centre Southern Region are checking the health of the elephants and the conditions of their shelters,” Mr Supot said. Orders to carry out the campaign came from the top, he said. 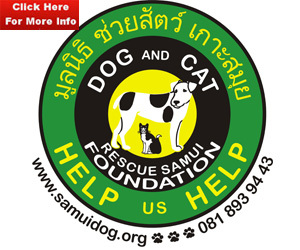 “Over the past few years, there have been problems with elephant livestock identification certificates and Thailand was considered at risk of breaking the CITES* convention, so Prime Minister Prayut Chan-o-cha is paying particular attention to this issue,” Mr Supot explained. Elephant owners have until next Thursday to register their pachyderms with the DNP, he warned. “The deadline is Jan 26. After this day, any elephants not correctly registered with the DNP will be seized and the owner will face legal action,” Mr Supot warned.